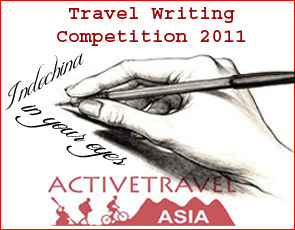 ACTIVETRAVEL ASIA's Blog: Active Travel Asia announced the prizes for the contest “Indochina in Your Eyes”! Active Travel Asia announced the prizes for the contest “Indochina in Your Eyes”! First word Active Travel Asia sent to you to joint our competition “Indochina in yours eyes” most sincere thanks! “Indochina in yours eyes” contest lasted over 2 months (1st Sep 2011 to 20th Nov 2011) and ends on 20 Nov 2011. Organizing Committee has received many entries with unique ideas, deeply felt and very sincere, especially from customers love traveling and traveled to Indochina in a lifetime. Now is the time to honor the winner. The winner is the person who has the amount of LIKE ranked highest on our facebook page plus 2 travel news sites. It meant that many people had read and liked your story. The highest prize of the contest “Indochina in your eyes” is Yasmine Khater with entry "South to North Vietnam : An Unforgettable Experience". The prize is a 3 day 2 night tour costing from 700$ - 1000$ for 2 persons. The winner can choose one of out door activities including Trekking, Cycling, Motorcycling, and Kayaking in wide areas of Indochina plus interesting gifts. • a couple of sleeping bags by fabric filter. • a couple of T-shirts with ATA logo. • 1 hour Cyclo (Xich Lo) around old quarter. Active Travel Asia thank all of your contest whether your felt and shared were not high rank but your sharing for ATA is the most precious. All good thoughts of you for Indochina and ATA will be the core values which always lead to ATA. Please thank most respectfully to you, wish you good luck and congratulations again! Please refer any questions about the award to us at: event@activetravel.asia.